Later in the day, Variety published a story containing additional sexual harassment allegations against Lauer. The story cited accounts from three unnamed women. The publication also included allegations that NBC News protected Lauer, citing several woman and saying "they complained to executives at the network about Lauer's behavior, which fell on deaf ears given the lucrative advertising surrounding 'Today.'" CNN has not independently confirmed the charges. And Lauer has not commented. "We can say unequivocally, that, prior to Monday night, current NBC News management was never made aware of any complaints about Matt Lauer's conduct," an NBC spokesperson told CNN in the wake of the Variety story. Lauer's sudden ouster came as a shock to viewers -- but not as a complete surprise to his "Today" show colleagues. They knew that Variety and other news outlets were investigating Lauer's off-camera conduct. The accuser's attorney, Ari Wilkenfeld, said it was a three-hour-long meeting. "My client detailed egregious acts of sexual harassment and misconduct by Mr. Lauer," Wilkenfeld said. The source said the woman alleged that the inappropriate behavior began while Lauer was in Russia covering the Winter Olympics in 2014. Lack may have been alluding to the ongoing investigations into Lauer's behavior. Variety reporter Elizabeth Wagmeister said on Twitter that she had been pursuing "serious sexual harassment allegations against Lauer" for two months. 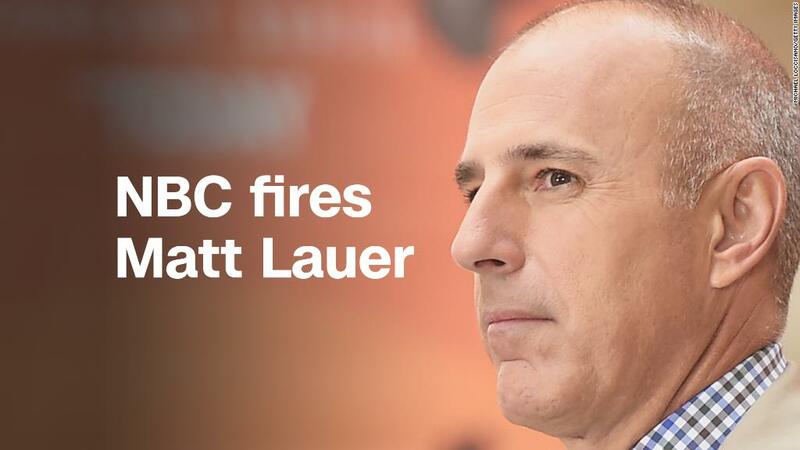 Lauer's colleagues were visibly shaken up about the firing news on Wednesday's "Today" show. Guthrie, his co-host for the past five years, was told overnight about his termination. The network now has to figure out how to replace him at the anchor desk. Lauer is the latest high-profile man in media to be brought down by allegations of inappropriate sexual behavior. Just last week, CBS News fired one of its own morning anchors, Charlie Rose, after a report in The Washington Post chronicled years of alleged sexual misconduct on his part. The torrent began when The New York Times and The New Yorker reported on allegations against the Hollywood producer Harvey Weinstein. --CNNMoney's Jill Disis, David Goldman and Chris Isidore contributed to this report.